Piece with flying geese and half-square triangles. 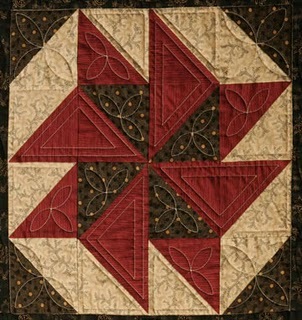 This is the first block in the free Civil War Quilts Block of the Week and is an old design with many names including “Devils Puzzle,” Winding Blades” and “Flyfoot.” At Civil War Quilts, it’s known as “Catch Me If You Can.” Although pieced from 16 half-square triangles, you can eliminate some of the matching seams and bulk by using four flying geese and eight half-square triangles instead. Do you see it? Note the four larger orange triangles. If you simply make flying geese units (I recommend Speed Piecing Method A at this link) with the light color on the left and the dark on the right, you would have the same look without a seam down the center. How cool is that. Then you’d need just eight half-square triangles sewn together in pairs and added to the top of each flying geese to make four identical units. Rotate these as needed and sew together to form the block as shown. What do you think? Can you see other ways to easily make this block? If so, please post a comment and share!